These classes are for students 8 and up who have never sewn before or who have only some experience sewing. Classes are grouped in blocks of 6 weeks. New sewists will learn how to operate a sewing machine safely. They will work through a basic sewing projects to learn a variety of sewing techniques. As students become more confident in their basic skills they can try more challenging pre-approved projects. A basic sewing kit is required for each student. Project materials will be an additional cost depending on the project. ------------------------------------------------------------------------------------------------------------------ Thursdays - 4:00- 5:30pm Session One - September 20, 27, October 4,11,18, 25 Session Two - November 8, 22, 9, December 6,13,20 Session Three - January 10, 17, 24, 31, February 7,14 Session Four - February 28, March 7, 21, 28, April 4, 18 Session Five April 25, May 2,16, 23, 30, June 6 Each Session of 6 lessons is $90. Materials are not included. To register email: bev@zazzystitchers.ca Please include the student’s name, day and time slot preferred. I will reply with acceptance into the class and e-transfer info. __________________________________________________________________________ Sew On - Intermediate Stitchers This class is for students who have some experience sewing and are ready to expand their skills. 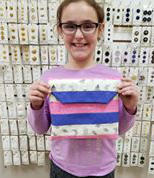 Students will work on projects to further develop their individual sewing skills and learn new ones. Monday ( 90minutes) 3:30 - 5:00 pm 5:00-6:30 pm Session Two - November 5,12,19,26,December 3,10 Session Three- January 7,14, 28, February 4,11,18 Session Four - February 25, March 4, 18, 25, April 1,8 Session Five - April 22, 29, May 13, 27, June 3, June 10 --------------------------------------------------------------------------------------------------------- Tuesdays - 4:00- 5:30pm (90 minutes) Session One - September 18, 25, October 2, 9, 16, 23 Session Two - November 6,13, 20, 27, December 4, 11 Session Three - January 8,15, 22, 29, February 5,12 Session Four - February 26, March 5, 19, 26, April 2, 9 Session Five - April 23, 30, May 14, 21,28, June 4 Each group of lessons is $90. Materials are not included. To register email: bev@zazzystitchers.ca Please include the student’s name, day and time slot preferred. I will reply with acceptance into the class and e-transfer info. Fancy Dresses Pattern Preparation with Heather Part 2 Saturday May 18- from 10:00-1:30 p.m. ( bring your own lunch and snacks) Fee: $35.00 Have a wedding. Prom or Special occasion coming up and need a new dress? This class will continue to work on pattern adjustment for any style of Formal Style dress. Next class-Special sewing skills-linings, invisible zippers, and sewing with silks, chiffons and satins. For students at an intermediate sewing level. The class is suitable for children 11 years and up, teens and adults. Students with some experience in pattern adjustment are welcome to join this class. If you are interested in any of Heather’s classes please contact her at heather@zazzystitchers.ca. Heather will contact you and arrange payment.